Nathan ben Simson was an outstanding artist who obtained many commissions from the aesthetically demanding court Jews in Vienna. The title page of this prayer book shows the prophet Moses and the priest Aaron in Rococo style. The cover is made of Morocco leather, a soft goat leather, inlaid with gold. 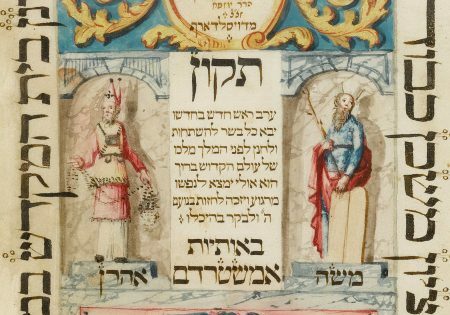 Tikkun be-Erev Rosh Hodesh (Prayers for the Eve of the New Moon), 1727–1728, Nathan ben Simson from Mezeritsch (today Czech Republic), Vienna, parchment.